Nestlé Purina scientists share information and results that direct decisions in the development process from the research center to the food bowl. 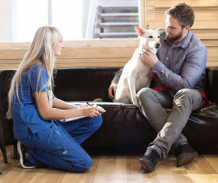 We also understand how nutrition affects a range of important health issues, so we work to help pets live longer, healthier lives by pushing nutrition forward in the areas of healthy aging, healthy metabolism, oral health and microbiome digestive health, healthy early development and well-being. A recent innovation in our work on healthy aging is Purina® Pro Plan® Bright Mind™ Adult 7+ formula, launched in 2015 in the U.S. and Canada. Around age 7, a dog’s glucose metabolism in the brain begins to change, which can affect memory, learning, awareness or decision making. After years of research, our experts have created a way to promote alertness and mental sharpness in senior dogs.